WARNING: ebookpedia.org is selling the download of “Honfoglalás… the Magyars are back home! [Full Version]”. DO NOT PAY! It is NOT the entire book; they are selling the abstract that you can download from the next line! I am NOT involved in that tricky business. In the 2nd millennium B.C., the Pannonici (a European Flavio population, who had written the Vinča signs) used the Flavio 16-letters VUARK alphabet (See my previous book). Around 1000 B.C., before the Celts would assimilate them, some Pannonici migrated and settled around Dzungaria, in Central Asia. They brought their rovás there, encrypted them, and spread them over a large area, in Asia. The oldest inscription written in Pannonico VUARK has been found in Central Asia. The inscription has been dated 5th century B.C. and confirms the existence of the rovásat a much earlier date than has so far been believed. This script consists of letters, which existed already in Pannonia in an alphabet of the 14th century B.C. (see my next book) and in the earliest Etruscan and Greek alphabets. The script contains characters and ligatures that would later be used in Southern Chinese and other Asiatic scripts. The Pannonico Pazyryki, (taken from the name of their common sacred place, in Central Asia) opened the Silk Road, through the Dzungarian Gate, at least 2,500 years ago. They established ‘China settlements’ along the Silk Road from Loulan (Tarim Basin) to the lower reaches of the Huang He and even in Yunnan, Southern China. They became a rich population. They wore silk clothes, gold juwelry, Celtic style garments, and the same conical headdress that had been in use in Europe before the arrival of the Indo-Europeans. They enjoyed ephedra and they could afford to leave real treasures in their tombs. In 160 B.C. some Pazyryki moved from China to preside over the northern branch of the western silk route, thus forming a line of peoples (allied with the Chinese), which stretched from the Turris Lapidea to the western terminal of the northern silk route, Tanaïs, on the Don River. At the same time, the Chinese started garrisoning the Gan Su Corridor and, in 138 B.C., they completed the lengthening of the Great Wall in order to protect the Corridor from the Huns. At the end of the 2nd century B.C., the Chinese had complete control over the eastern branch of the Silk Road from Chang’an to the Turris Lapidea. Trade on the northern silk route died down after the Roman Emperor Antoninus had opened the sea route, in 166 A.D., and later, with the decadence of the Roman Empire. In 330 A.D., the Chinese abandoned the forts that defended the eastern silk route. In the middle of the 9th century, the Uyghurs, a Turkic people, invaded the Tarim Basin, where the Pazyryko Arsi, an Ugric population, was dwelling since centuries. 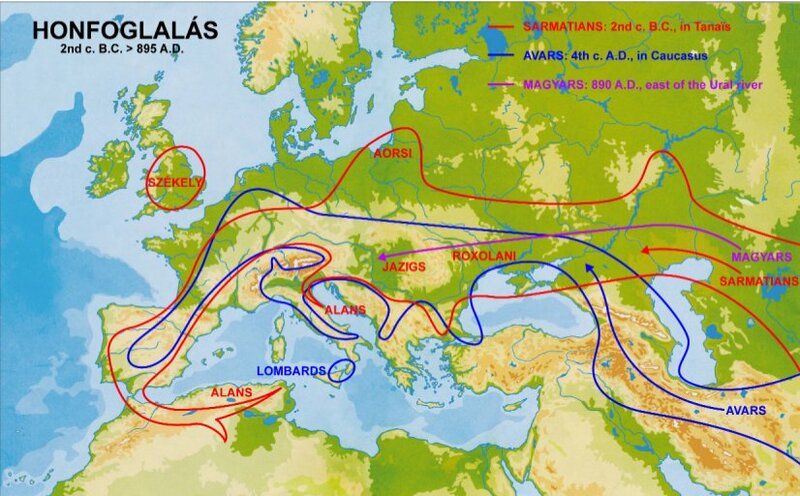 The Arsi, the Alans, the Seres and other Flavio populations then left Central Asia, gathered between the Volga and the Don rivers, confederated, and, in the year 895, took possession again of their ancestral lands in Pannonia – Honfoglalás. The Magyars still used the same language, the same rovás, and the same numbers that they had used 2,000 years earlier, in Europe. The alphabet research confirms a collection of old and ‘new’ evidence from anthropologists, linguists, geneticists, historians, and archaeologists. Most of the ‘new’ evidence is not even new. It is simply old evidence that nobody had ever connected, or had any interest in connecting it, to the Hungarian history… or ‘they’ had connected it to the ‘Aryans’! This book is about how the Pannonici became Pazyryki and finally Magyars. This research has been made possible by the recent easier accessibility of Russian and Chinese sources. ISBN 88-95025-08-03 (978-88-95025-08-7), 272 pages, including 50 black and white tables, plus 2 coloured maps. Key words: History of Fenno-Ugria – Origins of the Runes and Rovás – Silk Road – Etruscans – Tocharians – Ainu – Neanderthals – Non Chinese scripts in China – Yunnan – Origins of Democracy – Urheimat – Honfoglalás – Pannonico cultural heritage in Asia – Contribution of the Magyars to the Chinese, Korean, and Japanese cultures. · Harvard-Yen Ching Institute, Cambridge, MA, U.S.A.
· Prifysgol Cymru, Wales, U.K.
· Silk Road Foundation, Saratoga, CA, U.S.A.